Protection Engineering Consultants (PEC) recently collaborated with Rutherford + Chekene (R+C)—a structural, geotechnical, and building systems engineering firm headquartered in San Francisco, CA, and our partner on our current GSA IDIQ task type contract—to develop a unique seismic risk rating system to meet the needs of the General Services Administration (GSA). Development of this GSA seismic risk rating system started with HAZUS and its building-specific module, the Advanced Engineering Building Module (AEBM). The GSA will use this new rating system to develop a database of their building inventory, which will include key building information, seismic parameters, and a seismic risk ranking to help identify vulnerable buildings and inform seismic retrofit priority. A sample group of 71 Federal buildings was used to validate the seismic rating system. Based on the success of this project, the GSA is now carrying out seismic evaluations of additional buildings in their inventory, after which they plan to utilize their new seismic rating system to develop a subsequent seismic retrofit strategy. The basis for the General Services Administration’s (GSA) seismic program is the Earthquake Hazards Reduction Act of 1977, which required the President to adopt a set of standards for assessing and enhancing seismic safety in federally occupied space. In 2016, Executive Order 13717 was signed “Establishing a Federal Earthquake Risk Management Standard” and authorizing the Interagency Committee on Seismic Safety in Construction (ICSSC). The ICSSC developed a minimum set of seismic performance criteria for buildings occupied by the Federal Government. The standard provides a consistent method of assessing seismic safety and mitigating the risks from a seismic event. The GSA uses the most recent edition of the ICSSC standard, which is titled the Standards of Seismic Safety for Existing Federally Owned and Leased Buildings, ICSSC Recommended Practices 8 (RP8). RP8 currently references industry standard ASCE 31-03 for seismic evaluation and ASCE 41-06 for seismic upgrading. The ICSSC committee is considering adopting ASCE 41-13 Seismic Evaluation and Retrofit of Existing Buildings for both seismic evaluation and upgrading of the Federal building inventory. Many of the buildings in the GSA inventory, while designed to applicable codes at the time of construction, do not meet the performance standards of RP8. Consequently, the GSA solicited aid in addressing this issue; specifically, a team to develop a sound technical approach for quantifying the relative seismic risk among their buildings not meeting the RP8 requirements. The HAZUS methodology defines a geographical area for analysis, defines a seismic hazard, overlays inventory, estimates damage, and ultimately estimates losses in terms of casualties, damage costs, and downtime. The “inventory” in HAZUS includes most everything in a community, but focuses on buildings. Buildings are characterized by Model Building Type (i.e., structural system) and Occupancy Class, and each building within the geographical area of interest is represented by approximate square footage within the region. 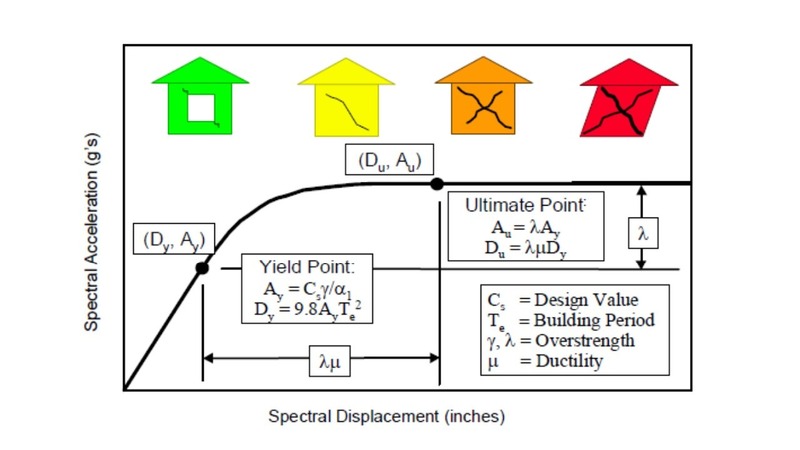 HAZUS defines many seismic characteristics of each Model Building Type, and the occupancy of a building is used to define the value of the contents to estimate losses. HAZUS employs a rapid and approximate analysis method to estimate the proportion of each Model Building Type that is in various damage states, from slight damage to complete damage. In HAZUS, losses are not estimated on an individual building basis. In contrast, the HAZUS AEBM module, which was officially released in 2003, extends the core HAZUS methodology to focus on the individual building level. AEBM identifies parameters that define the structural characteristics of a building, identifies site seismicity, and converts damage state probabilities to building-specific loss estimates in terms of casualties, damage costs, and downtime. The first formal implementation of AEBM was by California’s Office of Statewide Health, Planning, and Development (OSHPD) agency, and other agencies and organizations have since followed suit. Examples include the Department of Veterans Affairs (VA) for seismic risk ranking of VA hospital buildings and the Judicial Council of California (over 450 facilities). The R+C led team developed the new GSA seismic risk rating system in a format able to (a) use data from existing seismic evaluation reports as input and (b) output a defensible, building-specific seismic rating based on the HAZUS AEBM methodology and the 2013 California Administrative Code, Title 24, Part 1, Chapter 6, Section 1.8 Collapse Probability Assessment (OSHPD’s HAZUS re-assessment methodology). A rating system calculator was developed, which calculates a seismic risk rating for a given building based on complete damage state probabilities. The complete damage state probabilities are calculated based on structural capacity, seismic hazard, and significant structural seismic deficiencies that influence building capacity and building response (defining damage state). Structural capacity is derived from the seismic design coefficient (i.e., base shear) determined for a given building based on the lateral force resisting system (Model Building Type), size, location, and the age of the building. Seismic hazard is defined based on National Standard hazard maps. PEC was pleased to support R+C, our GSA IDIQ partner, for this exciting and important project. We look forward to more years of collaboration with R+C as we mutually strive to solve seismic and blast engineering problems for the GSA. To learn more about R+C’s and PEC’s seismic assessment and advanced analysis capabilities, contact Afshar Jalalian or Peter Revelli at R+C or Dr. Eric Sammarco at PEC.